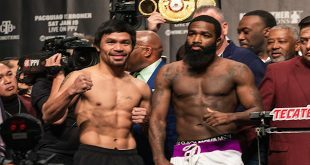 In a battle of pound for pound titans, undefeated two-division world champion Timothy “Desert Storm” Bradley will defend his WBO welterweight title against Manny “Pacman” Pacquiao. This will be Pacquiao's first fight in the U.S. since 2012. Promoted by Top Rank, in association with MP Promotions and Tecate, Pacquiao vs. Bradley 2 will take place, Saturday, April 12, at the MGM Grand Garden Arena in Las Vegas, Nev. It will be produced and distributed live by HBO Pay-Per-View beginning at 9:00 p.m. ET/6:00 p.m. PT. When Pacquiao and Bradley rumbled the first time on June 9, 2012 at MGM Grand, Bradley's hand was raised via a controversial split decision, ending Pacquiao's welterweight title reign as well as his seven-year, 15-bout winning streak. "I want my title back and I am prepared to endure my hardest training camp ever to win this fight against Tim Bradley," said Pacquiao. "It is very exciting to be returning to Las Vegas. And as always, I dedicate this fight to my countrymen throughout the world and to bring glory to the Philippines." "This fight is to get the credit I did not get the first time," said Bradley. "I must beat Pacquiao as convincingly as I beat Juan Manuel Márquez." "Tim Bradley is one of the toughest guys in the world and I saw that up close when he fought Ruslan Provodnikov last year," said Hall of Fame trainer Freddie Roach, who worked Provodnikov's corner. "Tim looked even better in beating Márquez in his last fight. Tim is the champion and Manny and I know we have our work cut out for us to successfully challenge him on April 12." "This is a fight which will give us peace of mind after the controversy of our first fight," said Bradley's trainer Joel Diaz. "We have to win and make it clear. It's not going to be easy for Pacquiao if he thinks he can beat Bradley. I will guarantee that." "At long last a competitive super fight," said Hall of Fame promoter Bob Arum. "I am sure the sports books in Las Vegas are gearing up for huge two-way action." "Rarely do we see two marquee fighters wanting to fight each other in order to settle doubt," said Todd duBoef, President of Top Rank. "Someone is going to be very disappointed after the fight." 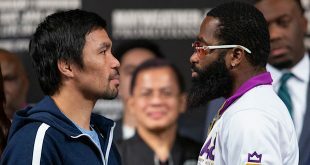 "Fight fans have been clamoring for a rematch ever since the decision of Pacquiao vs. Bradley I was announced on June 9, 2012," said Mark Taffet, Senior Vice President, HBO Pay-Per-View. "These are two exceptional athletes, elite world class prizefighters, who do not hesitate to accept difficult challenges on the sport's biggest stage. We can't wait for April 12th at the MGM Grand Garden Arena." "It is an honor to host this international championship boxing event at MGM Grand in April," said Richard Sturm, president of Entertainment & Sports for MGM Resorts International. "We look forward to another successful fight and know the rematch between Manny Pacquiao and Timothy Bradley will be exciting for the fans in the Arena and watching on television worldwide." "Based on the results of their first fight and considering Bradley’s recent success against Márquez and Provodnikov, this fight’s price will be much closer than the first time," said Jay Rood, Vice President of Race & Sports for MGM Resorts International. Pacquiao (55-5-2, 38 KOs), the lone congressional representative from the Sarangani province in the Philippines (he was reelected to a second term, running unopposed last year), is the only fighter to win eight world titles in as many different weight divisions. 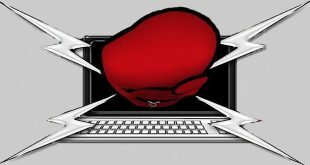 A three-time Fighter of the Year and the Boxing Writers Association of America's "Fighter of the Decade," Pacquiao's resumé features victories over future Hall of Famers, including Oscar De La Hoya, Ricky Hatton, Marco Antonio Barrera, Erik Morales, Miguel Cotto, Shane Mosley and Juan Manuel Márquez. From 2008 to 2010, five of his seven victories were world title victories in five different weight classes, from 130 to 154 pounds. No active boxer has sold more live tickets in the U.S. than Pacquiao, who is also credited with more than 12 million pay-per-view buys. He returns to the ring after a scintillating beatdown of former world champion Brandon Rios last November in Macau, China. Bradley (31-0, 12 KOs), from Palm Springs, Calif., a two-division world champion who unified the junior welterweight titles twice during his previous four-year reign, returns to the ring after three consecutive career-best victories. After moving up in weight and beating Pacquiao in 2012, Bradley co-starred in the Fight of the Year on March16, 2013, winning a brutal 12-round decision over future world champion Ruslan Provodnikov though Bradley was suffering from a concussion throughout most of the fight. In his most recent fight, on October 12, Bradley gave a virtuoso performance in defeating three-division world champion and Mexican icon Juan Manuel Márquez proving that Bradley is indeed one of boxing's elite pound for pound fighters.